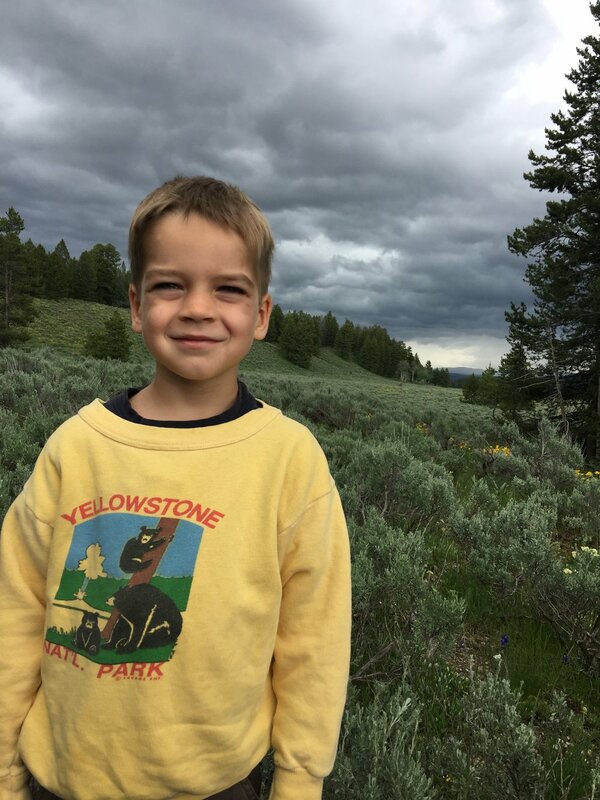 Goin Home - Part 2 - "Always"
This was a precious time for us in that bear paw meadow, facing the Teton range, as we laid beloved parents, grandparents and great-grandparents to rest. Ryan read Psalm 23, and Jon thanked God for their lives. They passed away in 2014, so it felt really good and satisfying to bring their bodies “HOME” to the place they loved so much. Home. What is home really, anyway? For me, home is where my loved ones are, or were, or the places that hold sweet memories. Going back to a childhood home or vacation spot, teaches that these places are not really home. Recreating an experience from the past is not possible. You can’t really ‘go back.’ Things change, loved ones go, and time marches on. But this is not sad. Home is not really here in this world. In Psalm 90, Moses called the Lord "our dwelling place in all generations." Because of Gary's illness, we had to downsize, leaving our beloved home where we thought we'd spend the rest of our lives. It was sad, but good for us. We were forced to cling to God instead of a place and lived in the love of our Savior who loves completely and unconditionally. He helped us face the very scary unknowns of the future with courage rather than fear. The most important "comforts of home" went with us, because Jesus lives in Gary and I. Jesus said, "I will never leave you or forsake you." He meant it. For a Christian, "true" home is a person, not a place. It's Jesus Christ, who loved me first. "We love Him because He first loved us." He paid the penalty for my sins, dying on the cross, and made me one of his own children, while I was His enemy. Then He went rose again, and went to Heaven where He has building a home for me and Gary is already there! Someday my family will take my ashes to the Central Coast, per my wishes. What’s left of my body will be “home” in the same place as Gary’s. But we will not be there. Not really. We will be at home with the Lord, in heaven, because home is where God is. The days go by so quickly. Before you know it, you're within the waning years of your life. Moses had such a wonderful perspective as he prayed. May we value the days as Moses did, and look to God for His favor, in light of what we truly deserve. 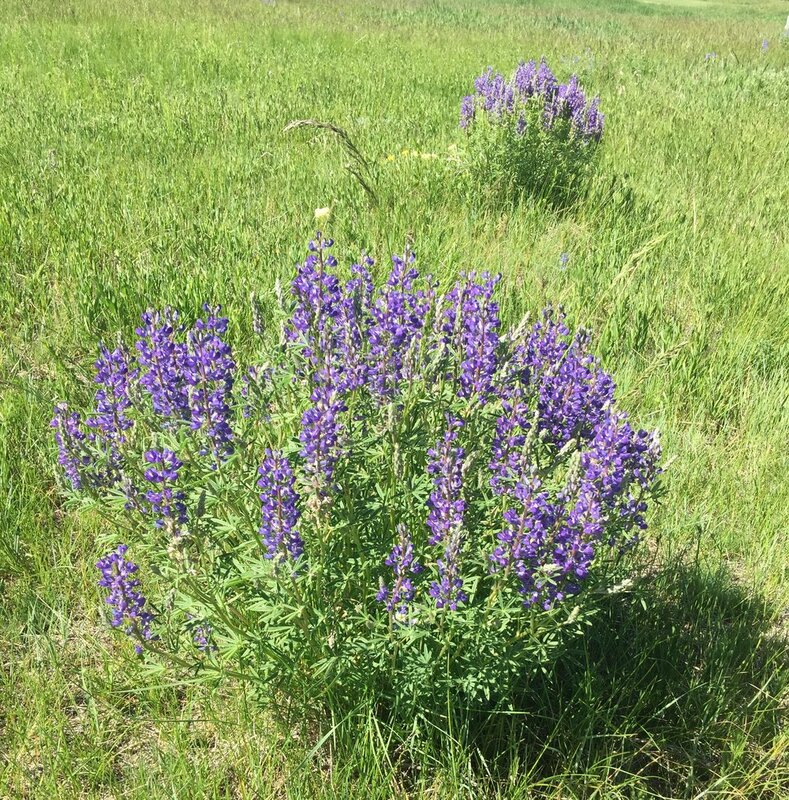 My last post was filled with sweet memories, formed over many decades, and new experiences too as our family “road tripped” to the ‘Wild West.” Click here, to read Part 1. Do return, O Lord; how long will it be? Goin' Home - Part 1 - "Heritage"
Our pleasant memories, shape our inward smiles. Sometimes a specific setting contributes to what we think and who we are. I have a place like that. It hosted six decades of happy memories for me, so the prospect of returning to the northwest corner of Wyoming, WITH my family, turned my inner smile into an actual “ear-to-ear grin." I grew up going to the Grand Teton National Park, and Yellowstone. I loved it so much, in fact, that I spent two summers there as a college student, working at Jackson Lake Lodge and hiking on my days off. After I married, Gary and I took our own girls there and when my parents retired in Bozeman, Montana, the Parks were on the way. I remember dad fishing his favorite spot on the shore of Yellowstone Lake, where he could guarantee a strike of a Rainbow Trout within just a few casts. One time, when cleaning the fish, a black bear approached, and he gave up his catch, retreating to the car instead. Mom sometimes brought her paints to paint "plein air." She often had dad photograph the scene so she could finish it in the comfort of home. My brother, Paul, six years younger than I, loved to fish, hike, explore, and see how far he could skim a rock. He was the adventurous, active type and my parents were always on full alert. He was the funny one, always willing to do a crazy pose or stunt for a photo. Photography was a big part of our vacations in the Parks. My dad's hobby turned into a retirement business later on, when he enjoyed selling his wildlife and landscape photos in the local gift shops. I remember waiting and waiting until the clouds parted so the sunlight was on the peaks, or the moose would lift his head "just so" for the perfect picture. Those were in the days of FILM, and one had to be more frugal with the number of photos one shot. We mostly camped, but had a few days in hotels too. The nights around the campfire, just talking and laughing are etched in my memory as some of the happiest times. My dad would let me warm my hands on his metal coffee mug, and Paul would poke around in the coals with a stick, as all boys like to do. The sudden and short-lived rain showers made for some great laughs as we scrambled to get under a tarp till it blew over, and every vacation, took on its own funny theme or joke. My parents would comment that the beautiful things we saw had to be made by a Creator, and could not have just "happened." Dad would say, "A bison and a butterfly are too unique to have come from the same set of cells. They had to be individually made." When I went back on my own, to work in Jackson Lake Lodge, it was a very different experience. Backpacking, making new friends, working in the laundry facility of the lodge, and learning about freedoms and limitations. It was a huge learning experience. The 2nd summer I brought my two best girlfriends from home with me, worked in the gift shop, and we had a blast, but by the end of that season, I was more than ready to get back to my boyfriend, Gary, who I had fallen in love with over the past school year. The phone booth in the Lodge where I had so many long, expensive conversations with Gary that summer. Can't believe it's still there. After we married, it was a thrill to share this wonderful place with Gary and do some new things with him. We hiked the big loop 20 mile loop through Cascade Cyn. to Lake Solitude to Paintbrush Cyn. We were surprised by a couple of moose near the trail, and felt the intense power and presence of God, high up in the mountains. It took us all day and we got back after dark, but I'll never forget it. Our girls loved making up little games together, tried to get the squirrels and chipmunks to come close bribing them with crackers, and laughing in the tent with their cabbage patch kids at night. One day, as teenagers, they would drive here on their own, on their way to see their grandparents'. Cousin fun in the van! After a year or so of planning, our family met up there in June. Some of us drove from Socal, and the rest met us in Salt Lake City, and we drove on from there together in two vans loaded, and I mean LOADED with food, luggage and 13 people. The Florida kids were "all eyes" as they were surrounded by mountain peaks and snow fields. I confess, it felt a little hollow, without Gary (2015) and my parents (2014), and brother (1979), but that void was simultaneously filled with sweet remembrance and new memories with my grandchildren and their parents. Lower Yellowstone Falls - 308 ft. Yikes! It's difficult to describe Yellowstone Falls. It's frightening, beautiful, powerful, and "puts you in your place." 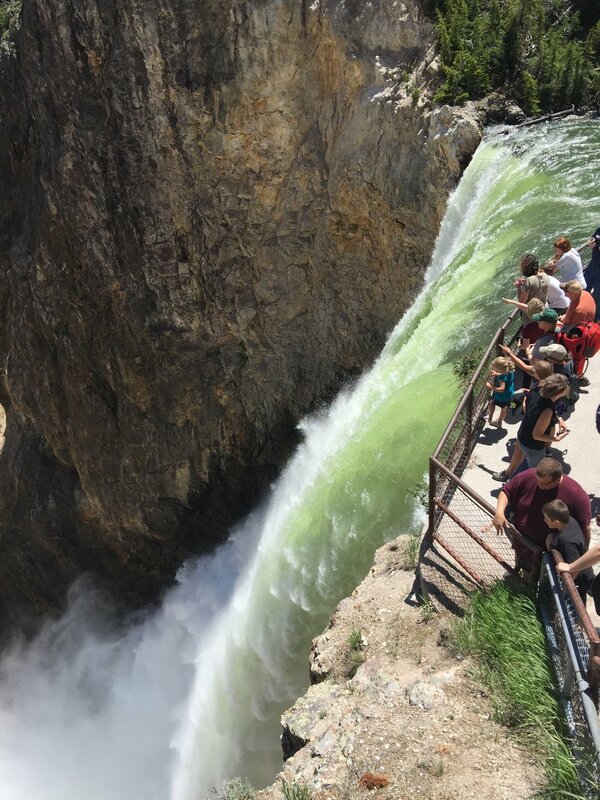 My dad described the feeling as he wrote, "I defy anyone to stand next to the protective guard rail, eyes focused on the tons and tons of water accelerating over the brink and not feel some strange powerful force take hold with its unrelenting grip." It is good to be reminded of the smallness of me, and the greatness of God. Bison and Geysers and US! For all my grandkids it was their first time in the Parks, except for the oldest who went as a baby. 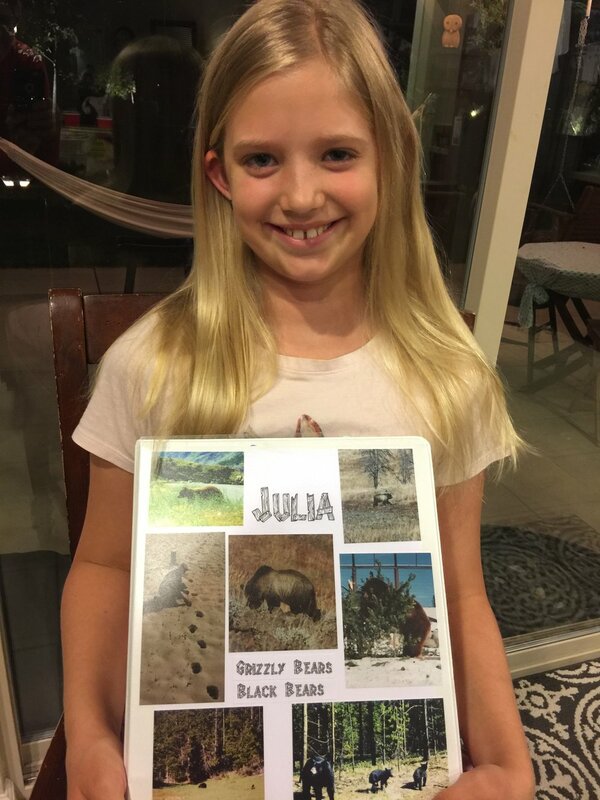 I gave the younger ones some activity notebooks, decorated with my dad’s wildlife photos. I said something about earning "points" for finding wildlife, and in no time, there was a big competition between the kids. Bison families - parents loosing winter coats. Their searching eyes were rewarded with many good sightings of pronghorn, bison, deer, moose, black and grizzly bears, and even a wolf. 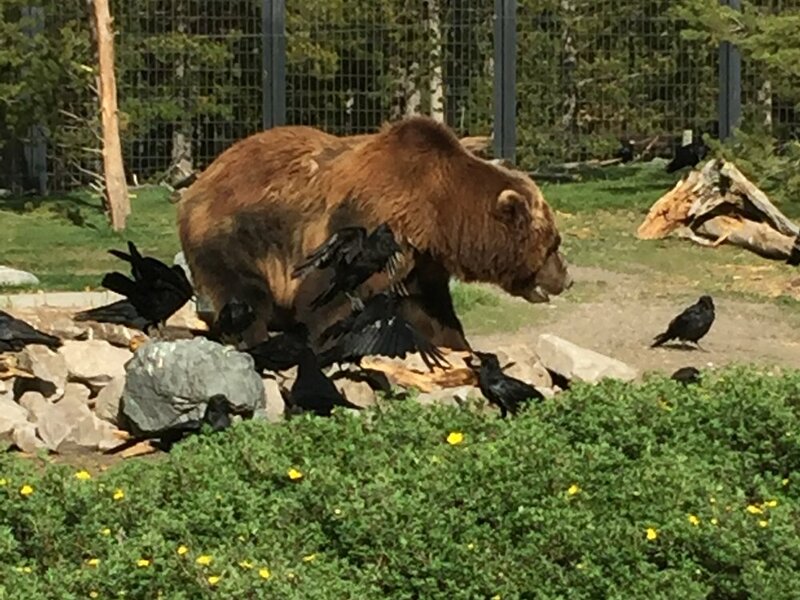 The bears were distant, so we took an afternoon to visit the Grizzly and Wolf Discovery Center in West Yellowstone, where the animals are free to roam in their very beautiful and natural environments, but close enough to really watch them without using binoculars. Thank you Mr. Rockefeller and Mr. Albright! The next post (Goin' Home - Part Two) will be more of a reach into life-shaping memories and the importance and reality of 'home' along with the mission I was sent on by my parents. 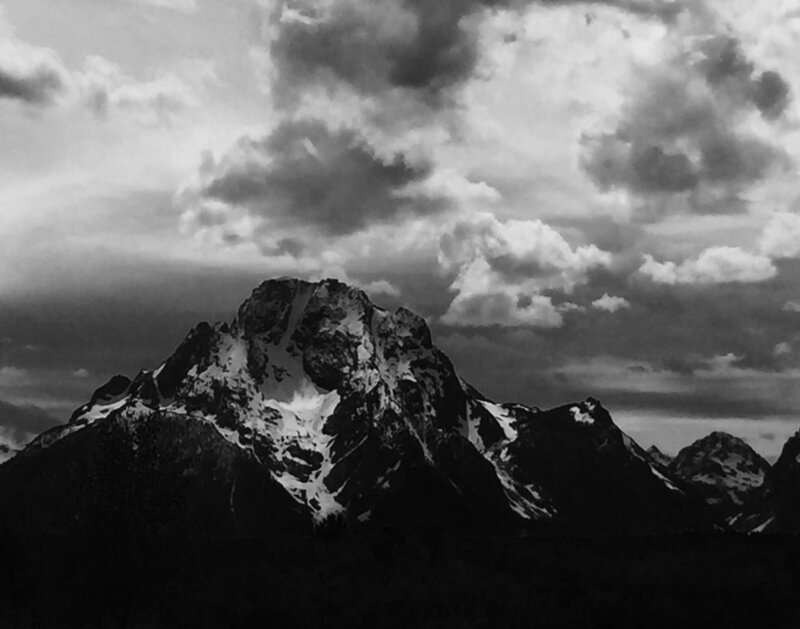 For the last couple of photos today though, we'll go back to the Tetons. There's a very short hike up Lunch Tree Hill, adjacent to Jackson Lake Lodge. (my old place of employment) On vacation in Yellowstone, in 1926, John D. Rockefeller, Jr. enjoyed a picnic lunch here. With the Teton Range in view, he was inspired to use his wealth to preserve this area (along with others) as a National Park and along with Horace Albright, Yellowstone superintendent at the time. It took many years, and it took some doing, but their plan was finally accomplished. The complete story is in the Ken Burn documentary, The National Parks - America's Best Idea. I highly recommend it, especially if you're on the fence about where to spend your vacation. AND 4th Grader's families are free this year. (Every Kid in a Park) Between our 4th grader for one van, and my lifetime senior pass for the other, we paid nothing. I hope this wets your appetite to get outside, experience the power of God's amazing earth, and make some lifetime memories! A new interest for this one? Grand Canyon of the Yellowstone (view from the falls). Brink of the Falls. Yikes! One of many beautiful life-sized animal sculptures in West Yellowstone. This one's at the Grizzly and Wolf Discovery Center. "Enough with the crows already!" Grizzly-Wolf Discovery Center, a great place to see these majestic creatures in a natural and beautiful environment. Gray Wolf at the Grizzly-Wolf Discovery Center. Beautiful to watch the pair interacting. They are so like their domesticated kin, dogs. 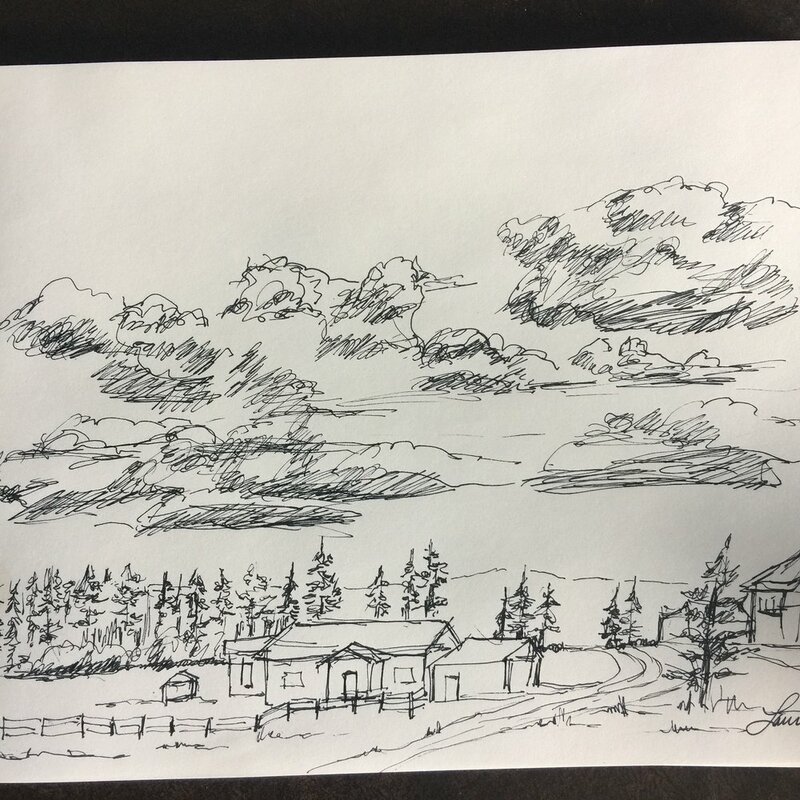 I had a very little time for art, but managed to sketch the scene from our back porch in West Yellowstone area. The whole gang in Jackson, WY! 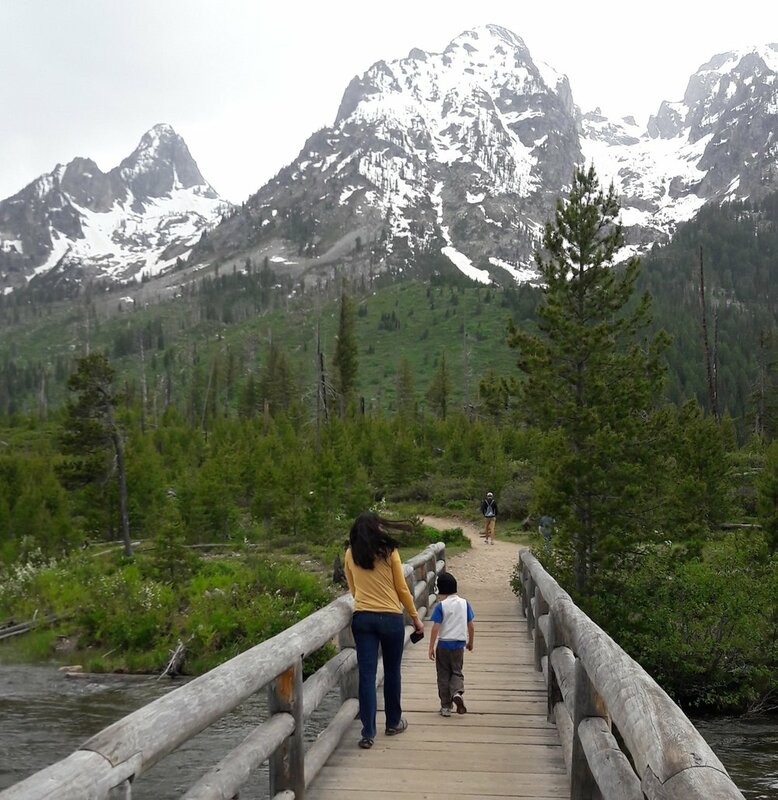 Gateway to the Tetons, Yellowstone and a wonderful family road trip! Do you have an extra special place that you smile about? If you care to leave a comment, I'd love to hear why is it's special to you? Fog. It doesn’t happen too often here in Socal, but I’ve been in thick fog before and I remember how it felt. There’s a mystery in its quietness. Sounds are muffled, and it’s hard to make out what’s ahead, OR behind. The view ranges from completely opaque to blurred vaguely familiar objects. It slows you down, the fog creates an awareness of being alone, and unsure. A year and a half in to my widowhood, I’ve heard “Fog” used as a metaphor for how things feel when grieving, and it’s an apt description. A friend recently shared this little book with me. Joyce Rogers, (widow of Adrian Rogers), passed through the “fog of loss” and gifts us with simple truths, and practical steps. Joyce understands the unsettled feelings. "Who am I now that Adrian is gone?" The book is only 110 pages and it’s divided into two parts, the Profound and the Practical. Nothing is more PROFOUND than God’s love and care for widows. Joyce emphasizes that God is the “husband” of widows. From the book: “His name means ‘the Lord of hosts.’ He is the leader of all the hosts of heaven. He fights my battles for me.” p.8In one chapter she explains some of the names of God, and how the character trait of God applies to widows. i.e. our Refuge, Strong Redeemer, Provider, etc. In the Appendix there is a larger list. Sprinkled throughout the book are encouraging thoughts about Heaven, scriptures categorized for specific needs, and comforting poetry. My personal "fog" is lifting, and I understand that it's a process finding my footing alone, after being Gary's wife for 40 years. Some days the path is clearer than others. I think the best part of the foggy weather in my life is that it forces me to slow down, walk carefully when unsure, and cling to the everlasting arms that are constantly holding and guiding me. Thank you, Mrs. Rogers, for helping me along with the process. And besides You, I desire nothing on earth." Next Friday will be the Anniversary of our last goodbye. Over the last year, as a recent widow, I have sought to understand my new and different life. After forty plus years with my husband, I find myself alone. For all those years, and right up until Gary died, I knew exactly what I would and should be doing each day. My life with my sweetheart was good and fulfilling. In the months following his departure, adjustments have been made in my life and are still happening. I suspect the future will hold more changes, and growth for me as well. That’s ok. The changes are sometimes hard, or painful, but I'm seeing that there is good on the other side. Discovering (and dealing with) the new me! I’ve been learning about “the new me,” the “me-without-Gary.” We were one flesh for 40 ½ years and I’ve been shaped by him. Being alone, and being in the grief stage, I've found some things in my heart that need to be repented of. I've also found more depth in some of my interests and creative side. There are brand new and faith stretching opportunities to explore and I plan to do so. (Specifically an upcoming trip I'll be sharing about here.) The Lord has used Gary to help me grow, as a Christian and as a woman. I am still “me” but I am finding new ways to grow. Saying "yes" to everything - well not EVERYTHING, but too much! One thing I’ve noticed is that after nine years of having certain restrictions on my life, (because of Gary's health needs), I began to say yes to everything. Well maybe not “Everything” but lots of things. I kind of went crazy with going here, going there, doing this and that, and taking on a lot. Nothing bad here, just LOTS. I was wondering how the Lord would direct me, and unfold what He wanted me to do. I’ve been able to see more clearly now certain things that are more important than others and great ways to enjoy life. I don't think I will EVER really get a handle on time management, but I've noticed that I need to be on guard against being greedy. For instance, I like to put many intriguing things on my list of "to-dos" but sometimes it's better to do fewer things, and do them better. There will never be enough time or opportunity to do everything. It's ok to dream, but when something can't be done, I must not get frustrated, but rather be thankful for what I AM able to do. Changing roles is not easy. I’m almost through the first year of being on my own, and all the first holidays without Gary are behind me. I’ve been up and down with emotions as I approach the anniversary of Gary’s home going in a few days. Mostly happy for Gary, but sad when I think about the final goodbye, and missing my role of helping him. Through this entire first year, God has been at my side, drying my eyes, giving me things to laugh at, and love, and reminding me of wonderful memories with my sweetheart. I hope you are all expressing your love to your dear ones and treasuring your days together. We are only guaranteed the breath that is in our lungs at this present moment so make your day a good one. May we all feel and think deeply, and give ourselves completely to Jesus Christ so that our lives will count for eternity. Today is the nine month anniversary of Gary’s exit from planet earth after nine years of suffering with dementia. (Read more HERE.) May 13, 2015 marks the end of his silence, weakness, and loss, in this life, and the beginning of his perfect life in heaven. There is a special memory from that day that I am ready to share. Recalling this event, from the very end of his life, turns sorrow into joy for me. It is my gift of love and encouragement to you, dear friends. In order to explain, context is needed. Gary’s body had been shutting down for several days, and on Wednesday morning, there were signs that the end was approaching soon. Thankfully, Gary had no pain or agitation, and therefore, needed no morphine or other medications. His hospice nurses concurred that he was resting comfortably. Our family had been with us all week, and that morning, we had been reading favorite bible passages to him, singing hymns, telling him we loved him, and praying at his bedside, in between repositioning him and swabbing his mouth with water. He was extremely weak, but restful this day, as he had been for months really. If you recall, he had been sleeping/dozing for 20-22 hours a day for many months. As far as other forms of communication, Gary hadn’t spoken in sentences since 2013. In 2014 he said “Hi” or “Ok” every few weeks. Moments of eye contact were few and far between for all of 2014 as well, mostly because he so rarely opened his eyes. I believe he was still somewhat aware of things, right until the end, because when Pastor MacArthur had visited us a few days before his death, Gary squeezed his hand while Pastor John was praying for him, but his facial expressions had been “flat” for several years. Looking back through photos, I think the last true smile from Gary was at the end of 2013, in response to something Becky said, and even so, it was not his typical “Gary” grin. So, that morning, as the signs of impending death increased, we were all gathered around. We didn’t know exactly when he would take his last breath, but we all wanted to be there. Sarah had explained to the children that it is not a sad or fearful to see a Christian die because they will go straight into heaven to be with their Savior. We would know this to be true very soon. At a little before 11:00 Gary surprised us. He was laying on his side, and his eyes popped open, he craned his neck, and his frail, thin face broke into a huge smile. We hadn’t seen him smile like this in literally years. Silly me, I tried to engage him by asking him, “What do you see Gary?” I was hoping he’d talk to me, or look at me, but it was obvious that he was looking right past me, still grinning from ear to ear. I was shocked because I didn’t know his face was capable of smiling anymore. It was an excited look…truly happy with eyes wide open. I stepped back, so as to get out of his line of sight, and let him fully experience whatever it is that he was seeing. We all saw him looking so happy, and later surmised that he continued in this joyful state for about 20-30 seconds. It was long enough for the whole family to get around on our side of the bed to see him. Then he closed his eyes, and took a couple more breaths, about 30 seconds apart, and breathed his last. I do not know what Gary saw while his body was dying. He could have seen Jesus welcoming him into heaven and saying what we all long to hear…”well done, good and faithful servant...enter into the joy of your master.” (Matt 25:23) Maybe he saw God sitting on his throne in indescribable glory. (Revelation 4 & 5) For sure, he was leaving his body, and going into the presence of the Lord. (2 Corinthians 5:8) I will never know what Gary saw, until it’s my turn. We are sure, however, that while he was dying, he saw something amazing that made him happier than I have ever seen him. Not everyone is conscious, and unmedicated when they die so those standing around may not see an outward expression when a soul passes from earthly to eternal life. No one is exempt from dying, however, so perhaps you will use this little account of Gary’s happy face, to pause and think. Will your first view of the afterlife be as joyful as Gary’s was? Gary placed his entire life in Jesus’ hands because he knew he was a sinner in need of salvation. It is impossible to be good enough to get into heaven on our own. The bible speaks to this. I wrote more about it in this older post HERE. Splendor and majesty You place upon him. NOTE: Our Pastor, John MacArthur has written a great book, called “The Glory of Heaven.” It addresses the BIBLICAL description of heaven and the UNBIBLICAL accounts of near-death and other “heaven and back” experiences. You can get it on Amazon HERE. The sparkle is not gone. I polished them this morning since today would have been our 41st anniversary. I'm still wearing the rings Gary made for me. He hammered 50 cent coins into bands and then had a jeweler set his grandma's diamonds on them. On the inside you used to be able to see that they were minted in 1953 (my birth year) and read "In God we trust." but the words and numbers have long since worn away. Because they have been on my hand for so many years, and subjected to all of my activities, the prongs have needed adjustments, the bands have needed straightening, and a diamond was even knocked loose and replaced. I don't mind. I love that Gary made them for me and I still enjoy seeing them on my finger. They remind me of my loving husband, and our faithful God who enabled us to love and forgive for so long. My ring has changed. So have I. Marriage changes things. Especially people. Gary's influence in my life has shaped me, and moved me towards Christ. I recently listened to some audio tapes of him when we were dating. (He didn't like to write letters so he sent me cassette tapes.) We were silly, in love, and immature in many ways, but one thing stood out so clearly. Jesus was the most important person in his life. I loved him for that. Over the years, God was kind to grow us both. Gary is now with the Lord, without any sin. One day I'll join him. I am grateful beyond words for the time we had together. Yes, I miss him every day, but marriage is temporary. That is a good thing for all of us to remember. It is a constant temptation to make an idol of our spouses and let them become more important to us than God. When I am reunited with Gary it will not be as his wife. It will be as two grateful and amazed sinners who have been rescued from eternal punishment by their Savior and once shared a life together in "time." The following quote, from a book I'm loving right now, was written to parents who had lost a child, but as a wife who's lost a husband, I too have been blessed by it's weightiness. I'm halfway through the year of "FIRSTS"...First Father's day, first Birthday, first Thanksgiving, first Christmas, and first Anniversary...without my Gary. Tonight I have a special dinner planned with my daughter's family, so I have something to look forward to, and a new kind of special memory. Antique appraisers and collectors use the term "patina" to describe the color change on a metal object that results from age. Patina typically increases the value. My rings cost very little, even by 1974 standards, but they are precious to me because of the promises they represent, and the memories they carry. They grow more beautiful to me with age, because they carry a story with them. Tonight I went to dinner with April and Jon and the boys to celebrate God's faithfulness to Gary and I. God is attentive to my loss and is filling the void with other comforts so I'm in good hands. My prayer is that the loss of Gary will drive me even closer to the Lord. As I venture into the second half of the year of "FIRSTS," I pray that my love for Jesus will increase, since He is, and always will be, more than enough for this widow. There will be more layers of wear and polishing to be done in my heart as God continues to sanctify me. It's been an emotional week, just thinking about Gary, missing him, and remembering how special he was to me. Something broke the other day, that was special to him. It's a big crystal (2") that refracts the light beautifully. Gary bought it back in the 70's and hung it in our bedroom window. Every sunshiny morning, it cast rainbows on the walls. When we moved to our condo, it made rainbows here too. He'd say, "We have to get up when the rainbow gets to the doorway." He would sometimes stand in just the right spot to get the colors right on his mouth, or nose to be funny. Our girls remember too. He LOVED that crystal and we loved that he loved it. Well, finally last week, the wire broke and it fell on the tile, leaving some big chips in it. I need to rehang it, and hopefully it will make even more of a light-show now. But I got to thinking about something really neat. I was reading in Revelation 4 this morning. It describes the throne room of God. In his vision, the apostle John described the appearance of God , in terms of precious gems. "Immediately I was in the Spirit; and behold, a throne was standing in heaven, and One sitting on the throne. And He who was sitting was like a jasper stone (clear as crystal in Rev. 21:11) and a sardius in appearance; and there was a rainbow around the throne, like an emerald in appearance." Such amazing, heavenly sights and sounds were hard for John to describe. Right now, Gary's eyes and ears are filled with the actual glories of God. I'm comforted with the little memory of how he loved the light and colors displayed by his crystal, but thanks to the written Word of God, I get to know just a little of what Gary is experiencing right now, and that is even better. A few days ago I had the privilege of telling our story to a group of ladies at our church about our 9-year trial. I was asked to share how God had helped us along the way. It's been 5 months since Gary went to Heaven and it was the first time I'd gathered my thoughts about our years with Alzheimer's Disease as a whole, and the key ways our Lord impacted us during that time. It's a story of God's power on display through human weakness. If you would like to listen, click on the photo of Gary and I below. (It's audio of my talk along with a slideshow of the photos I showed during my talk.) OR, If you would rather read the notes of my talk they are posted below the photo. To listen to the talk, click this photo: (If you are viewing this in an email, you may need to view in your browser. I’m so happy to be here tonight to BOAST about my weaknesses because Christ used them to display His power. In order to do that, I need to go back a few years so you can see how God gave us more than we needed to succeed. Tonight you’re going to hear a sad story, but I don’t want you to be sad. You may be afraid that something like this would happen to you, but I don’t want you to fear. You may be right in the middle of something just as hard or harder, but I don’t want you to feel overwhelmed. I want to encourage you. I want to bring us to the God of grace who wants to strengthen you. I want you to smile with me at our great God, because I’m going to tell you what He has done. my husband and I promised God that we would love and serve each other no matter what. “For better or worse. For richer or poorer. In sickness and in health.” Looking back, we are grateful to God for our daughters, their husbands, and our grandchildren. We began attending Grace about 34 years ago and loved serving in the college ministry here for many years. Gary was an electrical contractor and I helped him with his business. We lived in the same home our entire marriage and had no plans to leave it ever. We were enjoying our grandkids and looked forward to travels to visit family and friends. Our lives were full and like most people, we had plans and dreams for the future. Our plans were not to be. "I am well content with weaknesses..."
I wasn’t always well content…I had my own set of fears. Would we both be unselfish enough to go through this trial in a way that pleases the Lord? I would have to give up my time, pursuits, energy for the sake of serving Gary completely. He would have to give up the things he loved, his work, his home, his fish pond. Gary’s responsibilities were added to my own, and it was a crushing weight. The transition into my new role was not always smooth. Early on someone gave me a wonderful book by Robertson McQuilken who gave up his career in order to care for his wife with dementia, because of his vows of love before God. This book set the tone for me. God used this man’s wonderful example to encourage unselfishness in my life. This trial really revealed the idols in my heart that were stealing my worship away from God. I found that “keeping things the same and comfortable” was an idol in my life. At times I resisted the changes coming. It was a grace of God that He revealed this to me. Would I be able to keep Gary at home with me or would he need a nursing home? I couldn’t bear the thought of him not being with me, yet what if I wasn’t capable of caring for him. Would I keep loving Gary when he no longer knows me? How do you love completely with no return on that love? He was already getting confused about who I was. He thought I had a twin sister who was trying to come between us. Between these episodes and the loss of his abilities to care for himself, there were many tears and prayers shed together. The losses were painful. I was in desperate need of grace and strength. On top of the personal losses, there were financial losses. We had financial needs. – Recently I was going over the events of the early years of the trial. Things were so difficult then. With Gary’s diminished capacity to work, we needed extra help to keep business alive, until we knew what was wrong. His business had been suffering for multiple reasons, but mostly because of his increasing mental problems. There was a real estate investment we had made before we knew Gary was sick, and it became a financial burden because Gary couldn’t keep up with it. We were financially unprepared for Gary to stop working. Once we knew what was wrong with Gary, we closed our business but that meant we lost our medical insurance as well as income. We were left with no resources of our own, and had to depend completely on God to care for us. HE DID. There were financial gifts and practical helps abounding from the body of Christ. God showed us that He was listening to my cries for help in a remarkable way. – I decided to apply for a job at our local Starbucks. For minimal hours there were full benefits, so we could get our medical insurance. It was close to our home and Gary could stay alone for short periods at that time. I don’t know how I got the job, apart from the Lord. There was a group interview with about 15 young people. Around the circle of applicants we were all asked ‘Why we wanted to work for Starbucks.’ Many noble answers were given, such as ‘wanting to be part of the SB community,’ or ‘wanting to change the world’ by selling such a good product that is fairly traded, and helping third world farmers. When it came round to me I said, “I really need a part time job, close to home that provides medical benefits.” The next day I got a call from the local store manager, and I was hired. I asked for the opening shift so I could get home to Gary when he was waking up. I was there for two years while we waited for Gary’s Medicare to begin. Though it was not an easy job, it was perfectly tailored to our needs, by the One who upholds us with his strong arm. Those years were exhausting. – I had to be at work from 4:00 am -8:00 am every weekday. When home I was liquidating Gary’s electrical inventory, tools and truck. There were many medical appts., as well as my regular activities. On top of that, our house was becoming a burden, since Gary was unable to take care of all the maintenance issues in the house and garden. I'd get off work, come home and mow the lawn or fix broken sprinklers...the things Gary used to do. I decided we should downsize and sell our beloved home. That added more work to do as we prepared it to sell. Looking back, it is amazing to me that I was able to persevere during these two years. Only by God’s strength. What seemed difficult for us, was easy for God. There were so many difficult unknowns. How would we survive financially? Gary was confused about who I was. Our ministry at Grace was fading away. We ended up switching from College Ministry to Mainstream because Gary couldn’t keep up with the pace and the constantly changing faces of the college students any more. For instance, he used to be involved in the lives of the students, having conversations on a Sunday morning, but he increasingly withdrew, getting his coffee and donut and sitting down alone. It seemed our usefulness in the body of Christ was ending. I didn’t know that God was preparing us for a future ministry. I will tell you about it later. In 2010 we moved to a smaller place that I could manage. At the beginning Gary and I went for walks and even took a couple of trips across country to see family, but his physical difficulties progressed, confusion got worse and soon we were staying close to home, limiting our days out. Gary’s world got smaller and smaller. So mine did too. I was depressed for several weeks over how Gary was declining so rapidly. This verse really ministered to my heart then, and repeatedly since. If God gave the very greatest gift for our good, then everything else He gives is good for us too. Through redirecting my thinking to what was true, God healed my heart and restored my joy. I referred back to this verse many times during the ensuing years. God had been graciously strengthening us for seven years. He proved His power in our lives in each daunting situation. I think it was to prepare us for 2014. We would need it more than ever. It is hard to describe the stresses and losses of last year. Even with all the good help from family, friends, and caregivers, there were times I wondered how I could manage to help all three of my dear ones. I felt like I was putting out fires constantly. For most of the year I was managing 9 caregivers between the two households. Gary became completely bed-bound, sleeping comfortably 22 hours a day, only awake while being fed his pureed food or having his teeth brushed. On the rare occasion he actually opened his eyes he did not appear to recognize me. He could do nothing for himself. My father was bed bound from a small hip fracture, and my mother was hospitalized with a heart condition. Things deteriorated and by October, both of my parents were in Heaven. There was much to do in planning their memorial services, settling their affairs and selling their home. There was little time to grieve their loss. I found myself increasingly lonely for Gary, sad about his condition, and overwhelmed with the pace of life and big decisions to be made throughout the year. Romans 8:35-37- Who will separate us from the love of Christ? Will tribulation, or distress, or persecution, or famine, or nakedness, or peril, or sword? Just as it is written, ‘For Your sake we are being put to death all day long; We were considered as sheep to be slaughtered.’ But in all these things we overwhelmingly conquer through Him who loved us. Pastor John explained in his commentary that to "overwhelmingly conquer" means to “Over conquer.” It's having victory with "success to spare." If we belong to Christ, He will make us victorious in our weaknesses. Since 2011 there had been no more “I love yous,” but I found that God was enough. When the feelings of loneliness rose up, I called a family member or friend, to ask for prayer. I remembered Romans 8:32; that God made the greatest sacrifice and would fill the voids in my heart. I did not despair. He heard every cry of my heart and provided encouragement every time I needed it. It might be a special verse, note from a friend, or remembrance of something Gary had said in the past. Remember that at the beginning I feared that I wouldn’t be able to love Gary enough. God gave me more love than ever for Gary. That’s SUCCESS TO SPARE! Yes, I was easily overwhelmed and uncertain. 2014 was a rollercoaster ride. It is hard to pace your life, when you don’t know how much longer your dear loved ones will be alive. There were multiple events across the street. My mom had heart problems, my dad was falling and ended up with a hip fracture and bed bound for 6 weeks. The days with my parents were precious and I’m so glad they were nearby. I would not have been able to travel to be with them. During this crazy time, my health began to give me trouble. Headaches, blood pressure, weight gain, allergies, neck pain. I was encouraged to get refreshment in order to not “burn out” so I knew I needed to carry on with my life a little. I enjoyed a couple of small trips last year, some special weddings, and kept up with my artwork which is always a sweet time for me to think and relax. I feel like I’ve been in a time capsule for years and lost time with my family and friends, especially the grandkids. Gary’s condition was fairly stable as he slowly declined, but precarious. Some event would occur that would take his life. A bed sore could lead to a systemic infection. Aspirating his food or drink could lead to pneumonia. Failure to swallow, could lead to starvation. He was so weak, that I began praying that God would take him home in God’s perfect time. On the other side of this trial, He is giving me back the postponed relationships and my body is recovering. GOD CONQUERED UNCERTAINTY WITH TRUST. That’s SUCCESS TO SPARE! Yes, I was in need of wisdom. There were so many big decisions to be made, and my “head” couldn’t help me. (I could use the entire evening on this point alone, but will just give you a couple of examples.) Should I continue going to church on Sundays without Gary? Should Mom and Dad go to assisted living? How many caregivers could they afford to hire? What about “end of life” planning? What would Gary want? How long should my mom be on life support? After Mom died, should my Dad live with me? When should my dad go into Hospice care? Etc., Etc. Hooray for James 1:5. “But if any of you lacks wisdom, let him ask of God, who gives to all generously and without reproach and it will be given to him.” Absolutely true! Every time I faced a big decision, the Lord gave me the wisdom I was asking for. Many decisions I needed to make involved our family. Thankfully, my daughters and their husbands are all believers so their advice was invaluable to me as well. We came together over many issues to see what the Word of God said. One of them helped me think through my concerns with going to church without Gary. Leaving Gary with a caregiver on a Sunday morning was one of the hardest things I had to do. I would be a weeping mess during the hymns. Why? Grateful to be there, praising God’s character, but sad to leave Gary at home after so many years of being at Grace together. But God wants us to meet together with the body on the Lord’s Day. By His Grace, I chose to obey, and it was such a blessing every Sunday morning to know I was pleasing God. GOD CONQUERED MY QUESTIONS WITH BIBLICAL ADVICE. That’s SUCCESS TO SPARE! Continuing in Romans 8, For I am convinced that neither death (Gary’s death) nor life (my life alone) nor angels, nor principalities, nor things present (our trial, your trial), nor things to come (the unknowns we fear), nor powers, nor height, nor depth, nor any other created thing, (even Alzheimer’s Disease) will be able to separate us from the love of God, which is in Christ Jesus our Lord. “I believe in the Lord Jesus Christ…to be all He represented Himself to be in the Bible. The Christ, the Son of God. I believe Him to be the soon and coming King. I am not a believer by birth, nor can I be without God enabling me. Jesus has forgiven all my sins, and has made me a member of His family.” G.P. If you don’t know Jesus, and have not yet turned from your sins, and submitted to His Lordship in your life, please don’t delay in making things right with God, through Christ. There is no victory, no success apart from Him. Meanwhile, my earthly life goes on. My hopes of Gary smiling at me, or saying a word, or noticing if I walk through the room, are over. But now there is something new. Feelings of joy and satisfaction, for Gary's new condition. I can’t wait to see Gary again, in Glory, where he and I will be face to face with the One who made it possible for us to keep our vows and love each other “no matter what.” I'm forever grateful to God for allowing us to travel this road together upheld and strengthened by the love of God. My 40 year ministry of serving my husband is over. God has me changing gears and it feels odd. Please pray for me going forward. As I grieve the loss of my Gary, I want to grieve in a way that brings God the attention and honor He deserves, letting others know that God is more than enough for any problem or loss, for those who are truly His. It’s easy to get ‘self-focused’ as a new widow, with many options before me. I want to make the best use of this time for the Kingdom. The faithfulness of God has not diminished just because Gary is not here with me anymore. God was faithful and good to Gary. That was evident in his life. The same faithful and good God is MY God too. I am excited to see how else He will continue to display His strength through my weakness. One of the things I’m most looking forward to is being useful at our Alzheimer’s Dementia ministry at GCC. We meet on the last Saturday morning of each month, for breakfast, spiritual encouragement, and prayer. We offer others spiritual support. Please pray for this very special ministry. There are no doubt many in our church who are touched by dementia, and could use the spiritual refreshment. Perhaps you would like a place to serve. Some in our group have a hard time coming to church, because there’s no one to sit with their loved one at home for a couple hours, or assist them on the campus. (i.e. You can’t drop off a loved one with dementia while you go park. They will wander away.) Others need help applying online for govt. services. The needs of primary caregivers are great and always changing. If you believe the Lord would want to use you to help us, please join us. Please let others know about this and encourage loved ones to come. I love sharing the practical things I’ve learned in caring for Gary. I've made many of them available in the Alzheimer's Resources section of my website. I can’t think of a better way to finish our time together, than by reading what Susannah Spurgeon wrote after the death of her husband, and preacher, Charles Spurgeon. I have traveled far now on life's journey; and, having climbed one of the few remaining hills between earth and Heaven, I stand awhile on this vantage-ground, and look back across the country through which the Lord has led me. A well-defined pathway is visible, but it appears devious and wandering; sometimes skirting a mountain-top, whence one could catch glimpses of "the land that is very far off"; and, further on, descending into a valley shadowed by clouds and darkness. At one time, it runs along amidst steep places, and overhanging rocks; at another time, it winds across an open plain, brilliant with the sunshine of goodness and mercy, and fanned by breezes which are wafted from the fields of Heaven. There are flowers of joy and love growing all along the way, even in the dark places; and "trees which the Lord has planted," give shade and shelter from too great heat. I can see two pilgrims treading this highway of life together, hand in hand—heart linked to heart. True, they have had rivers to ford, and mountains to cross, and fierce enemies to fight, and many dangers to go through; but their Guide was watchful, their Deliverer unfailing, and of them it might truly be said, "In all their suffering he also suffered, and he personally rescued them. In his love and mercy he redeemed them. He lifted them up and carried them through all the years." Mostly, they went on their way singing; and for one of them, at least, there was no joy greater than to tell others of the grace and glory of the blessed King to whose land He was hastening. And when he thus spoke, the power of the Lord was seen, and the angels rejoiced over repenting sinners. But, at last, they came to a place on the road where two ways met; and here, amidst the terrors of a storm such as they had never before encountered, they parted company—the one being caught up to the invisible glory—the other, battered and bruised by the awful tempest, henceforth toiling along the road—alone. But the "goodness and mercy" which, for so many years, had followed the two travelers, did not leave the solitary one; rather did the tenderness of the Lord "lead on softly," and choose green pastures for the tired feet, and still waters for the solace and refreshment of His trembling child. He gave, moreover, into her hands a solemn charge—to help fellow-pilgrims along the road, filling her life with blessed interest, and healing her own deep sorrow by giving her power to relieve and comfort others. Please pray for me and yourselves as well, that God’s strength would be abundantly displayed through our weaknesses. Let us anticipate how our Lord will give us success to spare…enough for our own difficulties, with an overflow to help others also. Projects help. Tackling something I've been ignoring, feels good. Accomplishing a goal is satisfying. Being busy is a distraction from the sadness of Gary's absence. A couple of weeks ago I freshened up my bedroom with paint, a new bed, and pretty bedspread, I really had fun with this after so long with a hospital bed, and other medical things dominating our space. Making Gary's eulogy video was a big project which I loved doing. I guess necessary paperwork and legal things are a kind of "project" too, although, not my favorite. Social Security had to be contacted, other things had to be cancelled or changed. The loss of a spouse requires this kind of activity and there's been PLENTY of it. I've been pretty busy. Most recently, the project was a memorial album to contain all the lovely notes, cards and photos from Gary's memorial service. After taking over my table for a couple of days, it is done. I enjoyed putting it together and reading some of those lovely and encouraging notes for the first time. It looks great and if you come over you will see it all finished on my coffee table. It's easy to obsess about finishing something that is occupying my mind and house so sometimes the daily tasks fall by the wayside. I am really enjoying my new freedoms and the opportunity to tackle some fun projects but after the project ends, with more time to think, I am sometimes hit with sad moments. I am wondering how to balance my time. When I was caring for Gary, I knew EXACTLY what God wanted me to do with my time. But now...for the time being, I am "doing the next thing" and praying for direction for the big picture. I am doing well, but don't feel as though I have found the balance yet. Staying "busy" is fun and distracting, but I want to be thoughtful like David. "Surely I have composed and quieted my soul; like a weaned child rests against his mother, my soul is like a weaned child within me." Psalm 131 I get that it is important for me to take the time to feel but I want to feel with right perspective. I had a fleeting moment of sadness and got misty yesterday in our Fellowship group at church. I was passing the weekly sign-in list of names to my daughter, Sarah, and noted to her that her dad's name is no longer there. She made the comment that his name is on a much better list. That made me smile. She was referring to the Lamb's Book of Life. "He (Jesus) said to them....rejoice that your names are recorded in heaven." Luke 10:20. Good theology is encouraging in a time of grief. I've been a widow for six weeks. My encounters with grief have been varied and haphazard. Sometimes sorrow surprises me, and at other times it builds up slowly. I don't have a clear view of what to expect, since everyone grieves differently but occasionally I hope to share a bit of what it's like, for me, and how I'm doing. Actually, I've been grieving for many years. Every time Gary reached a new limitation, I was sad for a time. New losses brought new kinds of sorrow, but once we adjusted to our new situation, I found we could flourish within our limitations. I'm expecting that process to continue. Two days after Gary went to Heaven, I suggested that our family go to dinner at Gary's favorite restaurant. "Damon's Steakhouse" has been a Glendale landmark since 1937, which explains why Gary's dad, Tom, used to go there on dates. Gary and I used to go there on dates too. In 1980 because of the Glendale Galleria project, Damon's moved to it's current location on Brand. (Behind the Center Theater and right next to Porto's) Our family considered it THE place to go for celebrations. Somehow, it seemed strangely important to go there and eat a Top Sirloin, stuffed baked potato, salad (tossed at the table and with amazing dressing) and garlic cheese bread "for Gary." I wasn't sure how emotional I would be, but I decided to "not care" and go anyway. The fun 50's Tiki-style motif was not lost on the kids. While we waited for our food, we walked around and looked at the huge salt water aquarium and shell lamps. There's even an outrigger canoe hanging from the ceiling with monkeys in it. Once the food arrived and after we prayed, we dug in. It was then that I was overwhelmed with joy mingled with missing my love. I looked around the table at our dear ones, and wished Gary was with us, but at the same time I was so happy we were all together in one of Gary's favorite places. So amongst my tears and smiles, memories flooded back into my mind. Romantic dinners, anniversaries, birthday celebrations... Gary, April and I had even had dinner there on our way to the hospital while awaiting the birth of Sarah's firstborn. As a grieving widow, I'm learning that it's ok to cry AND it's ok to laugh. Remembering is a really good thing to do because it keeps the joy in your life along with the inevitable sadness. I don't feel the slightest bit guilty for enjoying my meal six weeks ago. Every bite and flavor reminded me of some very good times, and I'm grateful that God designed us with the capacity to enjoy the world He made, and miss those who added to it's beauty. "A merry heart does good like a medicine." If you're in Southern California, and you want to make a memory with a good steak or seafood, click on the photo or HERE for info on Damon's. It was a joy to celebrate Gary's life three weeks ago with many of you. There are few events in my life that have been so meaningful. Thinking through his whole life, as I wrote his story, gathering the photos for his Eulogy, and selecting his favorite music, often brought me to tears of joy. Over the most recent years, I've wanted new friends and younger grandchildren to know the "old," healthy Gary. His memorial service was the opportunity. Looking farther back, it always amazed me how Gary's life was transformed by God. That was the best part of his story. April made the comment that "It's nice that we do Memorial services, because they give us a purposeful way to remember." So true. I'd been thinking about Gary's life for a long time during his steady decline, but planning this tribute has been a significant part of the grieving process for our family. Many who attended, had the same experience. We want to remember the things we love. I love my husband, and many of you did too. Thank you to all our friends who helped our family realize the dreams and plans we had for this very special day. And though Gary would not have wanted so much attention, we wouldn't have changed a thing. NOTE: My apologies if you already received this post. I was having a problem with the RSS feed, and needed to republish the post for those of you who subscribe to my blog. If you missed the memorial, you can watch it right here if you'd like. It includes tributes from family members, friends, and our Pastor John MacArthur, the Eulogy video, and reception photos. It is not brief but of course, neither was Gary's life. (If you are reading this via email, you'll have to click the "Read in Browser" link at the bottom of your email. I LOVE painting, and have many ideas for new watercolors. I actually just finished another one last night. I am so happy to have more time in my day to give to my creative side. Because there's time to think while getting lost in the process, I'm able to think, and dream. Then sometimes I write out my thoughts. I'd like to do a painting of our old home in Sunland to remind our family of all the great memories. I'm really enjoying doing ocean/beach themes prompted by our trips to the Central Coast. I have a few more baby animal paintings in mind too. Parents know this, and so do widows. Before you know it, another year is gone, and opportunities are squandered or embraced. As I mentioned in the last post, the freedom and time I have been given is precious. In order to give my self more fully to family, ministry, painting and writing, I've decided to scale back on some parts of my Colors By Laurie artwork, and step away from the greeting cards. I will continue to offer commissioned paintings (home portraits, monograms, baby names), and prints for sale, but I'm phasing out the greeting cards. The cards will be available for a limited time, so if you would like to purchase any, head on over to my shop soon. There are some fun new sets of four and other good deals while they last. Loosing Gary reminds me to value the time we've been given. Hopefully I will spend my allotment well. "So what are you going to be doing now?" Now that my number one love and ministry is not needing me anymore, my life is going to look a little different. One thing that struck me yesterday, is that the faithfulness of God has not diminished just because Gary is not here with me anymore. God was faithful and good to Gary. That was evident in his life. The same faithful and good God is MY God too. I am excited to see how He will display that in MY life in the years I have left. I don't know the details yet, but I do know some things for sure... I want to spend more time with younger women, encouraging them to live lives pleasing to God. 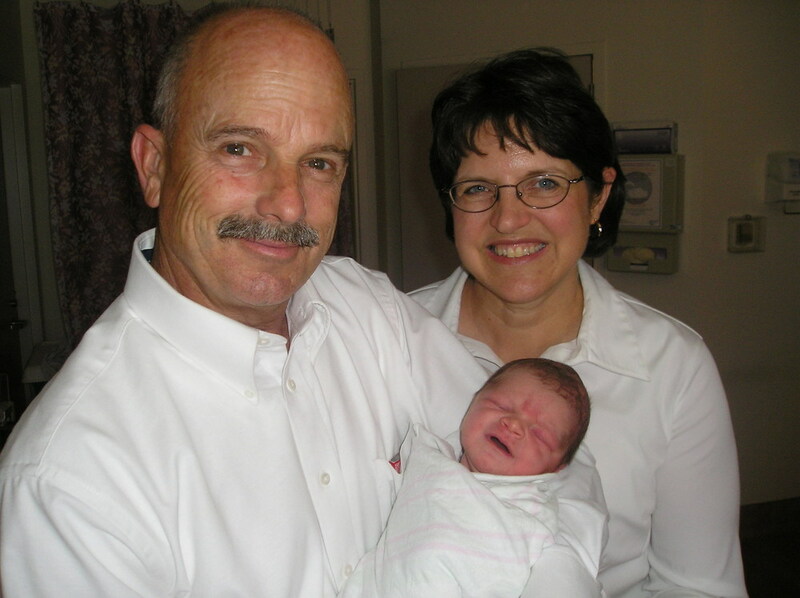 (Titus 2) I am looking forward to more time with grandkids so I can help them along the way as I enjoy them. As I move into my new role as a widow, there will be things to learn and discover. Gary would want me to embrace it, and try to see God's work in my life. There will be grief, but that is normal. I will try to seek comfort from the Lord. In my home, Alzheimer's Disease is gone but I'm not walking away from those who are suffering from it. I'm going to have more time now to help with our Alzheimer's Support Ministry at church. I intend to continue making the little instructional videos to encourage care givers, and provide other resources as well. I stood on our favorite beach yesterday, and cried, because the final chapter of Gary's life is finished, and I miss him. It won't be the last tears, but there is peace in the missing. It's so hard to explain and if you are a Christian, you know what I mean. It's a deep-seated joy and comfort that comes from the One who gave His life in exchange for mine. He said He would never leave or forsake me and he hasn't. He said nothing would separate me from His love and it hasn't. Gary is gone, but I am not alone. I'm anticipating a closer relationship with the Lord, and new opportunities to see His grace and love in my life. There will be joyful and sad discoveries, strange new feelings, and things to learn in these next weeks. I'm wanting to bring you along this next part of my journey too. Thank you for caring. Thank you for listening. I love to share with you and hope to continue doing so.